as Ensembles continues to collaborate with today’s most celebrated fashion designers through its Young Designer Series. This time around featuring Chris Diaz. Collaborations that aim to create something truly unique but will still be very much Ensembles – a perfect balance of wearability and artistry – versatile and timeless pieces that can be worn to work or on the weekend, just as easily. Chris Diaz discovered his passion for fashion design during his high school years. He’d be making designs for friends and a few teachers and was involved in the production as well. After high school, fate and luck lead him to work for a wonderful lace manufacturer that started his love for laces which then became his design aesthete. “Fashion schooling was not an option as times were hard then. I just slowly worked on becoming one while I studied and worked as an interior designer.” Being a finalist of MEGA Young Designers Competition in 2002 gave him a firm first step in the fashion industry. 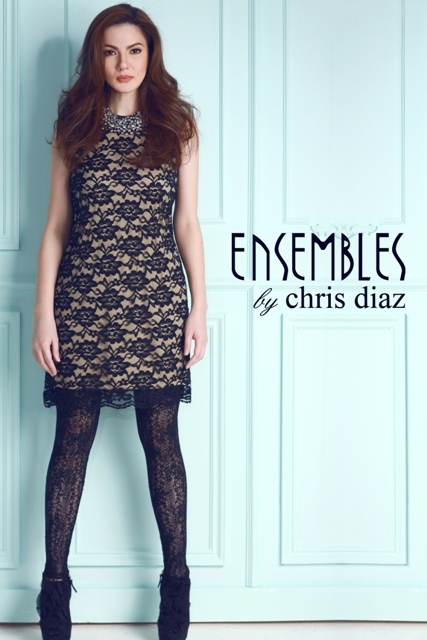 Visit www.ensembles.com.ph to view the entire Ensembles by Chris Diaz Young Designers Series Holiday 2012 Collection . Like on facebook.com/EnsemblesOnline and follow on Twitter twitter.com/EnsemblesOnline, Pinterest pinterest.com/EnsemblesOnline and Instagram @EnsemblesOnline.